September was a strange month, with the lead-up to annual conference dominated by suspense over Scotland. The NEC meeting scheduled for Tuesday 16 September was moved to Glasgow so we could all pitch in, and then cancelled as bad weather disrupted travel. Many staff and activists came straight from the campaign to Manchester. Opening the women’s conference on Saturday Harriet Harman welcomed Scotland’s decision, and said that independence was backed by 54% of men, but only 43% of women: whether the difference relates to caution about financial risks, dislike of personalities or something else has yet to be explained. She mounted a strong defence of all-women shortlists, the only method that had worked in lifting women’s representation in parliament from 3% when she was first elected to around one-third today. The day went well, particularly the sessions where members queue at the microphones – no having to “catch the Chair’s eye” – allowing a wide range of issues to be aired including food banks, the NHS, domestic violence, the gender pay gap and job-sharing for MPs. Scotland was still at the front of all our minds, and the NEC thanked Gordon Brown, Alistair Darling and everyone who had worked so hard. Registration levels of 97% and turnout of 85% were inspiring and 16- and 17-year-olds have surely earned a general right to vote, a commitment reaffirmed by Ed Miliband. Less positively there were reports of aggressive behaviour on the frontline, and a pervasive anti- politics mood where people felt that the economy did not work for them, and wanted change: the Yes vote was highest in the poorest areas. These threads run through the whole of the UK and there were lessons about reconnecting with voters. Labour has the policies – childcare, freezing energy bills, scrapping the bedroom tax and raising wages for the lowest-paid – and must get out and sell them. David Cameron’s opportunistic attempt to link new powers for Scotland with changing the basis of parliament was rejected. Alienation could not be countered with another Westminster stitch-up. Instead Labour proposed a constitutional convention, with ideas coming up from the grassroots, and the theme of devolution in a new landscape ran through the week. Regional assemblies were not the way forward: the north-east had rejected this option, and they would be seen as just another layer of politicians drawing salaries and expenses. Many favoured passing power and money down to city and county regions within the existing local government framework: an English answer to an English question. I am not sure. It sounds great for Manchester, Liverpool, Sheffield, maybe Cornwall, but the southern shires do not all have coherent economies or clear identities. Together the south-east, south-west and eastern regions have only ten Labour MPs for more than 200 constituencies and are virtually voiceless in the parliamentary party. County Labour groups may consist of one or two councillors in a good year and swathes of the south live under permanent Tory rule, so the association of Labour councillors is also geographically weighted. I am interested in views from all areas on how and if this would work. On Sunday delegates voted on which resolutions should be debated. The trade unions prioritised global human rights, low pay and insecurity, rail, and work in the contemporary economy, and constituencies added housing and the NHS. Delegates, aided by Christine Shawcroft, attempted to include the Middle East by referring back the conference arrangements committee (CAC) report. The unions backed this by 52% to 48%, but constituency delegates supported the CAC by 57% to 43% so their decision stood. Delegates asserted themselves later when the Chair tried to wind up an over-running session. People wave all kinds of objects – balloons, papers, items of clothing – in efforts to reach the rostrum, but waving a live infant worked best. With the hall chanting “call the baby, call the baby” the Chair had to give way. Ironically the mother turned out to be a parliamentary candidate, as were many speakers. This caused some resentment, but candidates in marginal seats are putting years of their lives into the campaign, with no guarantee of success. If a conference speech can help them, I’m in favour. The policy seminars, closed to the media, allowed many more delegates to speak directly to shadow ministers. New policy announcements included an £8 national minimum wage (good), using the married couples’ allowance to fund a10p tax band (good, though as with raising the tax threshold it does nothing for the lowest-paid), scrapping police and crime commissioners (good), stopping the badger cull (good), opposing TTIP (transatlantic trade and investment partnership) if it endangers the NHS (good), more money for the NHS through integrating health and social care, tackling tax avoidance, a further levy on tobacco companies and a mansion tax (good, though must allow for asset-rich cash-poor pensioners). I spoke in support of Labour’s general approach to social security bills. Where the Tories sanction claimants for flimsy reasons, humiliate disabled people with Atos’ work capability assessments and punish people with “too many” bedrooms even if no smaller homes are available, Labour would reduce in-work tax credits by getting more people into better-paid jobs, cut housing benefit bills by building truly affordable homes, and ensure that no-one is driven to food banks, payday lenders and destitution. Most of Ed Balls’ plans were already public, but capping child benefit at 1% for two years came out of the blue. This was never discussed in the national policy forum, and the NEC, like everyone else, heard it first on the morning news. Most think that it is a bad idea: we should be putting children first. On other issues, fracking is bubbling just below the surface and should be taken more seriously, and HS2, the high- speed rail link, provoked lively discussion on the margins. And 91-year old Harry Smith’s moving testament on life before the NHS reminded us of what is at stake next May. The treasurer Diana Holland presented the accounts, and at last there is light at the end of the 2005 loans tunnel. The delegate from Folkestone & Hythe then made an effective contribution. He pointed out that the amount paid to local parties had risen by just 4p to £1.54 per member [and even that is only because of my rule change last year]. They could not compete with national fundraising through e- mails and telephone cold-calling, and asked for a few more crumbs after the election. In fact this system was agreed in 2011 as part of Refounding Labour: local parties are no longer charged for election insurance, the Euro- levy, Contact Creator and one conference pass, a total benefit of around £1,000. The share of membership money retained centrally is available to constituencies for local campaigning and democracy and diversity projects, and in 2012 a number put in bids. Last year part of this fund was top-sliced for the national organiser scheme and most of the rest went to key seats within each region. However from June 2015 the fund should be open for bids again, and I will keep members posted. On more recent changes, some constituencies are keen to contact affiliated and registered supporters in their area. These will appear on Member Centre later in the year, but in the meantime secretaries can contact the membership services department at labourmembership@labour.org.uk for a list. On the final evening the NEC praised Ed Miliband for his speech, and he thanked members for their unity and loyalty. Christine Shawcroft raised the long queues, with some members unable to get in, and was assured that this will not happen again. Newly-elected NEC members were welcomed, Kate Osamor as a constituency representative, Jim McMahon and Alice Perry from local government, and John Healey in the MPs/MEPs section. They took over from Peter Wheeler, Ann Lucas, David Sparks and Dennis Skinner, leaving with more than 30 years’ service, and all were thanked for their contributions. Jim Kennedy was then elected Chair for the year ahead, the first-ever member of UCATT, the construction workers’ union, to hold the position, with Paddy Lillis of USDAW as vice-chair. Jim paid tribute to Angela Eagle, who has shown exceptional leadership through her year as Chair. She will continue to chair the National Policy Forum and the party reform implementation group, where her reputation for trustworthiness, attention to detail and capacity for hard work will be invaluable. Bombing Iraq: just the start? A Welsh view of Scotland’s ‘No’ vote: the end, or the end of the beginning? 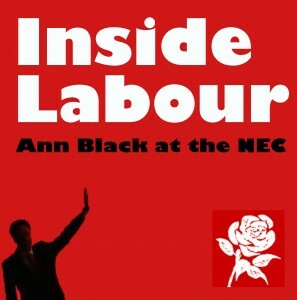 Ann has quoted Luke Akehurst,the Sec’y of the hard right,and somewhat shadowy,Labour First.It is very revealing.Under New Labour, Regional ftos broke their Code of Conduct and pressurised many Confce.delegates to vote for the right wing candidates.This cheating was very successful and as a result the Right could sit back and leave it to the staff.This year thanks to the efforts of Ann,the GS and others, there was little,if any,cheating.As a result the delegates voted for Anna Dyer for the NCC.Labour First have lost their crucial ally.It will be interesting to see how well they do on their own. more money for the NHS through integrating health and social care, tackling tax avoidance, a further levy on tobacco companies and a mansion tax (good, though must allow for asset-rich cash-poor pensioners). Will this mean ending the AA allowances for the elderly and removing PIP’s or DLA as Brown wished to do. Poor old luke told me on Labour list that he was to the left he was a socialist sadly he is more of a joke these days people see him as being a mouth piece for Progress. The sooner that group try to go for it alone the better.